A bricks and mortar bookie since 1982, Boylesports have gone on to claim the mantle as the biggest independent bookmakers in Ireland, and their online presence is strong too. Racing fans will find everything they need to enjoy themselves, and as you might expect Irish/Gaelic sports get more attention than at most other bookies; but make no mistake, Boylesports is a bookmaker that more than adequately serves the UK as well. Average odds are bolstered with plentiful promotions and daily specials, customer support is among the best in the industry, and there are a lot of handy extra features to play with too. In terms of scale Boylesport offers odds on 30+ sports, including a few you don’t see every day like Futsal, Field Hockey and, predictably, GAA Football and Hurling. However, they compete most strongly in Football, Golf, Tennis, Rugby, and Boxing, but the market variety can be a mixed bag. Horse and Greyhound Racing, of course, is a different matter entirely – if this makes up the bulk of your wagers you will be fine. Football is always a good barometer for market depth, and for top-tier games it seems to cap out at around 100, so there is more depth to be found at a few other bookies but it is still an admirable number – even League 2 games reach 60+. Conversely, while Tennis is widely covered many of the smaller matches have zero depth at all, so it really can be hit and miss. Outside of Football and Racing, Boylesport aren’t well known for offering the juiciest of odds, although they do offer best odds guaranteed on both Horse Racing and the Greyhounds, and are by no means the worst out there for the rest. It’s also worth considering that while the odds might not always be the greatest, daily specials, interesting and relevant promotions, and an ACCA loyalty program all help to increase their value. There are plenty of ante post betting opportunities too, so you can bring in some brag worthy returns on very favourable odds if you are willing to wait that long. Ante post bets may come with better odds, but when it comes to action and excitement live betting cannot be beaten, with odds fluctuating all the time as the match plays out. Every action on the field or court is a potential winning opportunity. Boylesports list hundreds of live events every day, even in the early hours of the morning, so there will always be something to wager on. Football, Ice Hockey, Table Tennis, and Basketball are all out in force, and even if there is a Tennis match going on at a secondary school in Wigan somewhere then, chances are, Boylesports will be covering it. The markets within those events don’t tend to be as varied as you can find elsewhere, but there should still be between 5 and 20 even for events with a lower level of interest. The interface continues to work to the punter’s favour here, with every sport and live event within that sport clearly laid out using the collapsible drop down menu’s. Another column shows events soon to start, and if you only want to view events that can are on TV there is an option for that as well. Before you select an event, there are clear symbols to indicate whether stats are available, and colour coded odds mean that you are always aware when something is changing so you can act quickly. The stats mostly only cover the game in question rather than details of previous form, although there is the odd bit – W/D/L for the last 5 games, for example. 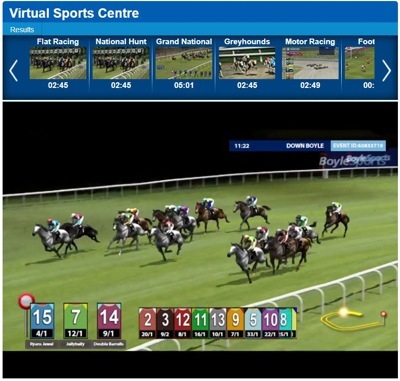 Live Streaming is currently only available for Horse Racing, which is a shame because everything else works so well, but they very kindly let punters know which TV channel will be showing the event. Setting a £5 minimum deposit across the board means practically everyone can afford to gamble with Boylesports, and they accept a diverse range of payment methods too – even cheques for you old timers. What’s more, they aim to process all withdrawal requests within 24 hours, after which it is down to your chosen payment provider to deliver the goods. This is about as much as they can do and few companies boast quicker time frames. Maximum payouts are where things get complicated, as it varies a lot depending on the event you have wagered on, although the average punter is unlikely to get near them; and the maximum daily withdrawal is, apparently, infinite. There are a lot of useful little extras on the Boylesports website. They are not all of them groundbreaking but they all serve to make your experience that little bit easier. 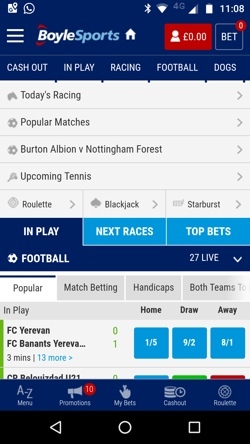 The Live Betting Diary, for example, will list the days’ televised events and which channel is showing them; the Betting News button opens their online news desk, giving you updates and top tips from their ambassador’s; there are ACCA’s with good promotions attached. 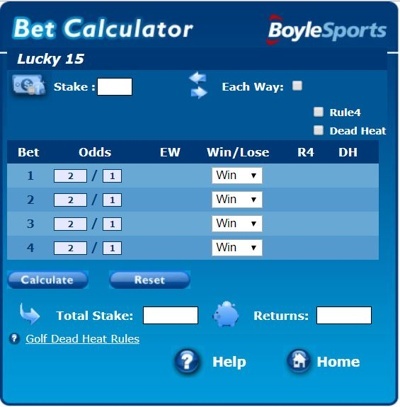 The Bet Calculator is an incredibly useful tool provided for free. You can use it to quickly work out your potential returns on any number of bet types and combinations. Use it for: Single, Double, Treble, Fourfold, Accumulator, Trixie, Patent, Yankee, Lucky 15, Lucky 31, and Heinz bets. Once the bet type is selected you can then play with the options for that specific bet such as each way, win/lose/place etc. It’s so easy to use that a novice could pick it up and master it in a few minutes, but there is even a Help button if you do get stuck. Cheers Boylesports. This is well worth a mention because there are usually quite a few of them, especially on the Horses and the Dogs. Football, Gaelic Sports and Rugby also tend to feature. You can guarantee there will be something of value in there and it’s enough to keep you checking in on a daily basis to see if there is a deal you like the look of. You can find the specials from the quick links menu on the home page. If you like betting on things that aren’t really happening, Virtuals are for you. At Boylesport there is Football, Rush Football, Flat Racing, National Hunt, Grand National, Greyhounds, and Motor Racing. In all honesty, the graphics aren’t much to write home about, but the commentary is decent and some of the events, especially the Football, are actually pretty fun to watch because the highlights are inventive. We even cheered once or twice. Markets are basic to say the least, but then how far can you go with an imaginary team/horse/driver? Cash out is on offer and it is the usual deal: settle your bet early to either guarantee a profit, albeit a smaller one, or to minimise your losses if you no longer think your selection stands a chance. The Cash Out icon is impossible to miss and it is available on most sports, although not on all events, so if it’s something you use a lot make sure you check before you bet so you don’t end up disappointed. The colour coded odds really help when cashing out, since you can instantly see if the situation is starting to improve or, heavens forbid, get worse. The associated Casino showcases literally hundreds of games including a lot of branded content in the way of video slots and is particularly good for Jackpots with 40+ to choose from. The Casino itself is 100% Playtech, but head to the Vegas section and you will find even more choice from other top providers such as SG and Quikspin. If you prefer a pack of cards to a slot machine, then the Table Games, a Live Casino, and a downloadable Poker product complete the package. While many online bookies choose to frame the odds with A-Z’s and offers, Boylesports have taken a slightly different approach, employing four distinct columns to display their wares. 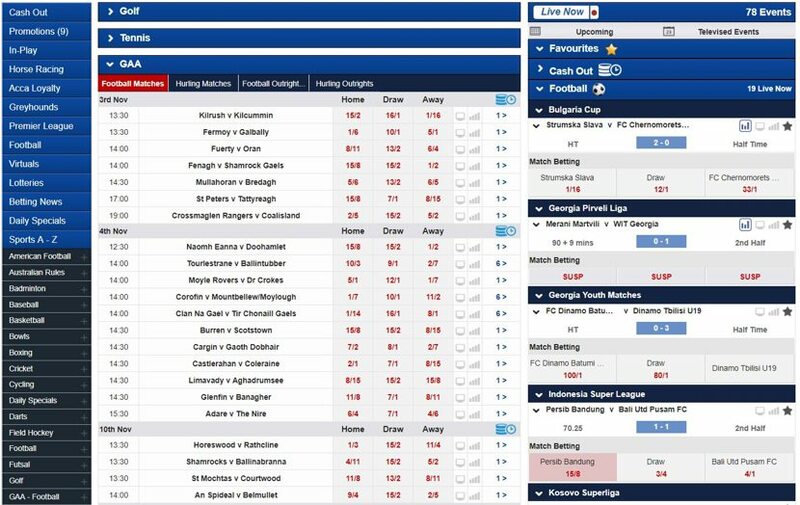 We actually think this works great on a desktop as you work your way naturally from left (A-Z of Sports etc) to right (events/odds, Live Now, Betslip etc) – one selection dictates the next. It means that navigation flows and the collapsible menu’s allow punters to see as little or as much of each sport or event as they choose. It might take some getting used to but it works. Handy quick links to Cash Out, Promotions and Daily Specials help the punter to make their experience as profitable as possible, while anything functional such as your Account and Deposit options are kept as unobtrusive as possible without becoming impossible to use. We had a few issues with loading times and traveling from one section of the site to another, there was the occasional sticky point, but all of the information for each event such as market numbers, stats availability etc is immediately on show so you don’t have to click through to find it. In essence then, you will never be more than a few clicks away from your end goal, but occasionally you might hit a stumbling block on the way to it. By its very nature, the mobile site could not employ a similar approach as the desktop site, and so it wears a more recognisable guise in terms of layout. Everything feels smoother and quicker on mobile, but we have to say that the reaction times could be better – we were hitting buttons twice because we thought it hadn’t worked the first time. This is only a minor issue but it can quickly become an annoyance, especially if time is of the essence on a mid-game in-play bet. 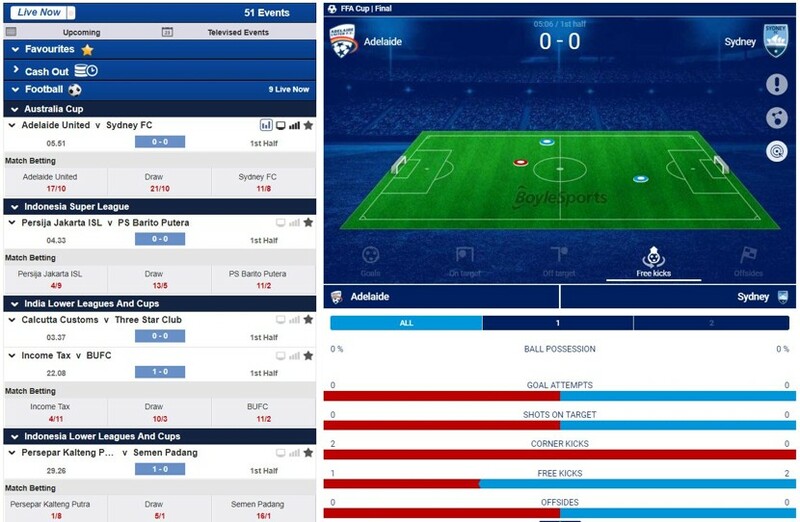 Speaking of in-play, everything you need to manage your bets and cash out is available instantly from the home screen which could end up being a lifesaver; and a lot of the same stats are available too, so the mobile in-play experience is almost as good as the desktop. The whole thing feels like it is given more space and the effect is a clearer interface which allows the bettor to focus in on one event at a time, rather than being distracted by everything else. The Menu button holds everything else you might need, just use the Home button (which is easy to miss) to get back to it rather than the ‘back’ button or you will be tapping for ages. Established by John Boyle in 1982, Ireland’s largest independent bookmaker now has its headquarters in Dundalk, County Louth, and runs 250 betting shops throughout the country. The company had grown steadily since its inception, but it was only in 2006 that they opened their 100th store and the speed at which they expanded increased massively after that, with strategic takeovers of Celtic Bookmakers and some of William Hill’s shops in 2011. They also introduced an online Casino product in 2007. Conor Grey took over from Boyle as CEO in 2017 and their 250th shop was opened in 2018. That’s 150 new betting shops and an online empire in just 12 years – quite a journey. Boylesports have been active in the sponsorship of various sporting events and teams, most notably as Sunderland AFC’s sponsor from 2007-2010, and being the headline sponsor for some of the biggest horse and greyhound races in the industry. Their biggest deal, however, came in 2014 when they became the sponsor of all RTE Racing programmes across TV, radio and online. That little deal was worth a cool €1,000,000. They have also made good use of brand ambassadors, who have included Stan Collymore, Kevin Kilbane, Joseph O’Brien, Gordan Elliott, and the celebrated jockey Robbie ‘Puppy’ Power. Boylesports is a trustworthy grafter of a website and a great choice for those of you who like to take advantage of the little extra’s. If you know how to take a promotion and make it work for you then give it a try. If you like a fully rounded in-play product it’s probably not going to be for you due to the lack of streaming and detailed stats, but there is enough data there for your average punter. Also, and without being trite, we would recommend Boylesports for the Irish. It’s obvious to say but as an Irish brand it naturally serves its nation’s people well in terms of local coverage. Of course, fans of Gaelic sport in general wherever they are from will find a lot to love here, too. Selecting the Help Centre from the homepage will open a new window with a searchable and well organised FAQ and also a Contact tab with the option to call, email or chat. Containing all of this in one separate section is fine, but it does take you away from the betting interface. The FAQ is decent but feels a little unfinished and seems to be compiled of questions punters have asked in the past. It makes sense to add to a pre-existing FAQ in this way but it doesn’t seem like a good place to start from. Moving on, and the Live Chat is brilliant we are happy to say. Once open it will follow you from window to window and the team are knowledgeable and courteous as well as being quick to respond. 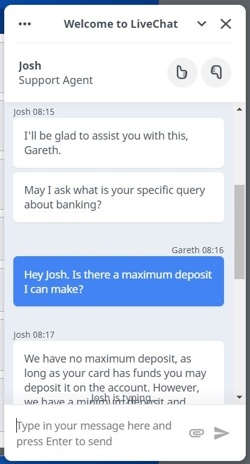 You can also find quick links to the Live Chat from the Cashier and Account section, which shows good forward thinking from Boylesports. The E-mail service is also effective and Boylesports are one of those rare bookies with a telephone support team; sometimes it’s just easier to talk in person, so this is great news. They are extremely active on social media so Twitter users can engage with a frankly excellent account that offers news, promotions, help and advice, as well as comical meme’s relating to the latest news. So, you have help on hand in some fashion 24/7 and every possible method of getting in touch. This is clearly a company who is easy to talk to. Live Chat – One of the best we have used. 24/7 service with quick responses that make sense. The functionality is perfect as well. Full marks. Email – Send your query to care@boylesports.com for a swift reply. Phone – If you are in the UK then 0800 22 00 66 is the number you need for phone support. Note: This is not the Fon-a-bet number, which is 0800 44 00 00. @Boylesports – This is a brilliant account as evidenced by the 65.5k followers. Funny, informative and extremely active every day.